Ross County attacker Billy Mckay. Ross County co-manager Stuart Kettlewell has backed striker Billy Mckay to rediscover his best form with the Staggies in the Championship. Mckay netted twice in County’s 2-1 victory over Hearts colts in the IRN-BRU Cup on Tuesday to take his tally to three goals in five starts so far this season. The Staggies were yesterday drawn to face League 1 side Raith Rovers in the second round, which will take place on September 8 or 9. Former Caley Thistle attacker Mckay netted 66 goals in 156 appearances over two spells with the Staggies’ Highland rivals, and after a slow start to his career in Dingwall he finished last season strongly despite County’s relegation. Although the Northern Ireland international faces increased competition following the addition of fellow attackers Declan McManus, Brian Graham and Ross Stewart, Kettlewell believes Mckay will thrive in the second-tier. Kettlewell said: “Despite the negative press Billy has had because he was involved in a few relegations, myself and Steven Ferguson have been in no doubt we have the right type in Billy Mckay. “He is a good lad to have about the place and he’s a goalscorer. Billy knows where the net is and has proved it time and again. “Yes, there might have been a wee loss of form, little dips when he wasn’t scoring, but we saw his finishes at Tynecastle. No matter what the competition is, that’s the mark of a natural goalscorer, those two types of finish. 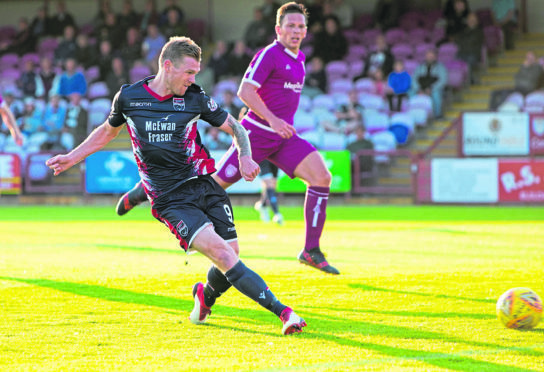 The Staggies face Hibernian in the second round of the Betfred Cup on Sunday, and Kettlewell is relishing the opportunity to spring a surprise in a one-off game against Neil Lennon’s side, who have enjoyed a fine start to the Premiership season. Kettlewell added: “We’re looking forward to it. There’s obviously that element where we know we’re playing against a top side in this country. “It’s a really hard place to go – they loads of experience, loads of quality. “But we’re excited about the tie. It’s a team we won’t play against in our league campaign, a different venue to go to rather than playing that fifth game against the same opponent over a season.